This tour forms part of The Cultural Experience The Invasions of Belarus tour, (see link), covering Napoleons invasion in 1812 and Hitler in 1941. Day Two: Kosava and Kubrin. On this day the tour visits Kosava and Kubrin, looking at some small actions during Napoleon’s eastward march. Day Three: The Storming of Brest Litovsk. On the first day of Operation Barabarossa on the 22nd June 1941 the German 45th Infantry Division assaulted the citadel of Brest-Litovsk, where the Germans had signed their treaty with Russia in 1917, ending the First World War. The 19th Century fortress complex standing on the River Bug has been left just as it was after the Second World War, in particular the bullet riddled Kholmsky Gate. We enter the complex from the east across a new bridge and explore the route of one of the attacking German battalions from its river crossing into the heart of the complex. At the northern edge we pause and investigate its storming by German General Guderian’s panzer gruppe during the 1939 Polish Blitzkrieg campaign, a similarly hard fought costly battle. The site is dominated by massive Soviet era heroic statues and monuments. There is an excellent 1941 defense museum in the complex and time permitting, an opportunity to visit the Soviet era steam locomotive museum nearby, where some of the exhibits are still run for movie productions today. Day Four: Stolovichi Village at the edge of the Minsk Pocket. Just off the major main road or rollbahn linking Brest through Minsk to Moscow, the advance route for the German Blitzkrieg vanguards, was the village of Stolovichi. The settlement was at the edge of a huge German pocket that netted two Soviet armies of over thirty divisions. Two Panzer Gruppen and 23 infantry divisions ringed the pocket, to hold the cut off Soviets in place. It was the first massive encirclement operation of the Russian front. We examine the German Grossdeutschland Division’s hard fought action here, to secure this southern section of the Minsk pocket. They had to contain ceaseless desperate Russian counter-attacks, until they petered out. It is a good site to describe the nature and tactics of the Barbarossa blitzkrieg advance, in particular a visual talk through how German panzer and motorized troops would encircle and capture a typical village. We also visit the Napoleonic battlefield at Gorodeczna, where Austrian General Schwartzenberg’s victory shored up the southern flank of the French invasion in August 1812. Just beyond Stolovichi is the site of the substantial cavalry action fought at Mir the previous month, and a chance to visit the beautifully restored castle, used as a dressing station in 1941. Day Five: The City of Minsk. Our exploration this day includes the site of the former Minsk Jewish Ghetto, as we explore the repression visited on the city during the German occupation. We visit the ‘Island of Tears’ monument for fallen Soviet dead in Afghanistan as well as the Monument for Fallen Jews, Victory Square and the Great Patriotic War Museum. There is time to see the Lee Harvey Oswald apartment building, where he lived, before his assassination attempt on US President John Kennedy in 1963. Khatyn Village is the site of the brutal sacking and burning of a village by the SS Dirlewanger Brigade during repressive anti partisan sweeps conducted in German occupied Belorussia in 1943.We visit the poignant memorial site dedicated to millions of citizens who perished during German ethnic cleansing and destruction of villages in Belorussia. We discuss and follow the course of the punitive operation, as well as the brutal repressive SS tactics employed, that wiped out hundreds of other villages in the region. On the way to Polotsk we pass a preserved section of the 1941 Stalin Line, bunkers built to bar the approaches to Smolensk and Moscow beyond. At Polotsk there is an opportunity to discuss the two battles that occurred there in 1812 and visit the Red Bridge, the regional museum and battle monument, before continuing on to Vitebsk. Day Seven: The Berezina River. After a brief exploration of central Vitebsk, the Belarussian city of culture, we drive south to examine the assault river crossing by Panzergruppe 3 across the Berezina River, which laid the foundation for the second huge Barbarossa encirclement battle at Smolensk. At Studianka we cover Napoleon’s narrow escape during the winter of 1812 across Baron Eble’s pontoon bridges spanning the Berezina River and frozen marshes. This relatively unchanged site still atmospherically reflects the horror and tragedy of the 1812 winter retreat. Even with the absence of snow, it is easy to interpret the geography at Napoleon’s crossing places, both marked, and imagine it how it was. Day Eight: Return to London. During the journey to Minsk airport there is an opportunity to climb the Mound of Glory vantage point, overlooking the historic approaches to Minsk taken by the Red Army when it liberated the city in the summer of 1944. It oversees the killing ground that saw the total destruction of the German Army Group Center, a decisive turning point in the Great Patriotic War, from which Hitler’s Wehrmacht never recovered. The battered Kholmsky Gate in June 1941 after its capture and its bullet-ridden facade below, today. The main monument ‘Courage’ dominates the battlesite. Russian memorial at Stolovichi Village at the southern end of the Minsk pocket. We examine this sector held by the German Infantry Regiment Grossdeutchland, against Soviet attempts to escape the pocket. 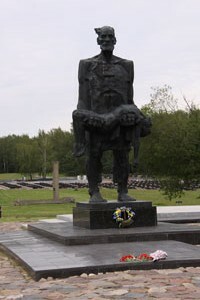 The poignant village memorial at Khatyn, where a father has discovered his limp dead child. The atmospheric steam locomotive museum at Brest. German soldiers investigate a destroyed Soviet bunker on the Stalin line in 1941. The same bunker remnants today. Vitebsk, city of culture, spanning the Berezina today. Napoleon's crossing point near Studianka. Napoleon's crossing point near Studianka today. The mound of Glory just outside Minsk City.